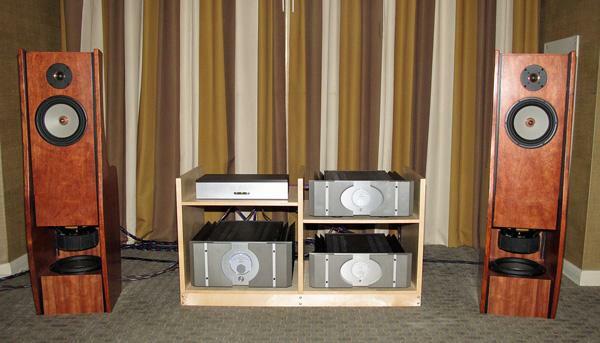 It is with heart-felt gratitude that we thank one of our long-time members, Don Naples, for the long-term loan of some beautiful Orion 4 speakers, analog signal processor and associated cables. We are also indebted to Pass Labs for loaning the electronics to drive the speakers, which Don also helped arrange. If you’re not familiar with the Linkwitz designed Orions, they are an open baffle speaker with an active crossover requiring separate amplifiers for the tweeter, midrange and woofers (two 10″ drivers per speaker). The Orion 4s are similar to the Orion 3s except that the Orion 4 woofers are SEAS in place of the Peerless drivers plus there is a structural change (to accept the SEAS woofers) to the cabinet designed by none other than Don Naples! The Pass Labs equipment includes an XP-20 preamplifier, two XA30.5 amplifiers for the tweeter and midrange drivers and an X250.5 amplifier to drive the woofers. Quite a nice stack of electronics! I know the membership will certainly appreciate this wonderful system at our upcoming events at The Shops at Hilltop in Richmond. Many thanks Don and Pass Labs!